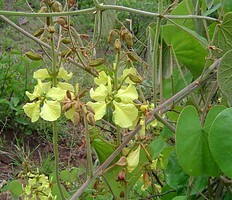 Found across the globe from North America to East Asia, the tribe Cercideae is the basally branching lineage in Fabaceae. The tribe is divided into two subtribes, Cercidinae, the subtribe containing Cercis, Griffonia, and Adenolobus, and Bauhiniinae, the subtribe containing Bauhinia sens. lat. and Brenierea, based on seed, floral and fruit characters (Wunderlin et al., 1981, 1987). Within Cercideae, Cercis L. ("redbud"), which is the sister group to the rest of the tribe, includes 10 species of shrubs and small trees found in Mediterranean climates from western North America to central Asia. Many of the species of Cercis have papilionoid-like flowers, but the genus is not closely related evolutionarily to Papilionoideae (Lewis and Forest, 2005). Cercis canadensis, found in the eastern United States, produces red-purple flowers that are edible and used in salads. Griffonia and Adenolobus are both African genera, with Griffonia found in Western Africa and Adenolobus found in Southwestern Africa (Mabberley, 1993). Adenolobus often have glandular fruits, the characteristic they get their name from, and grow in tropical to subtropical shrublands. Griffonia are shrubs and lianas found in tropical humid forests, swamp forests, thickets, and grasslands and are often used to make huts and baskets, and as medicines (Lewis and Forest, 2005). According to Lewis and Forest (2005) Bauhinia sens. lat. is divided into eight genera of trees and shrubs found in pantropical regions. The number of genera in Bauhinia sens. lat. is still debated due to great diversity among the group. The eight genera included in Bauhinia sens. lat. are Bauhinia, Gigasiphon, Tylosema, Barklya, Lysiphyllum, Phanera, Lasiobema, and Piliostigma. Brenierea is a monotypic genus (one species) of tree or shrub found in Madagascar in subtropical scrubland (Lewis and Forest, 2005). Bauhinia is a pantropical genus of 150 to 160 species of trees and shrubs, although most abundant in the Neotropics (Lewis and Forest, 2005), and many species are lianas. The flowers of Bauhinia are often pollinated by bats, birds, or insects and some species produce explosive fruit, known to project seeds up to 15 m (Mabberley, 1993). 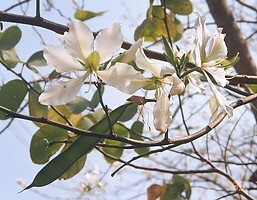 Species of Bauhinia are used medicinally, for tanning, and as food, dyes, and timber (Mabberley, 1993). The other genera in Bauhinia sens. lat. include several species of lianas and species that are important economically for their uses as timber, medicinally, and sources of food. Tribe Cercideae forms the basally branching lineage within Fabaceae (i.e., the sister group to the rest of the family), a position supported by numerous studies (e.g., Bruneau et al., 2001; Kajita et al., 2001; Herendeen et al., 2003). In spite of considerable taxonomic work on the tribe in the last 30 years, few species have been included in phylogenetic analyses of either molecular or morphological data and thus inter- and intrageneric relationships remain largely unresolved (Bruneau et al., 2001; Herendeen et al., 2003). Within Cercideae, Cercis L. is the most basally branching genus in the tribe, and recent studies have provided some resolution of relationships in this genus (e.g., Davis et al., 2002). Cercis plus Adenolobus and Griffonia appear to form the sister group to Brenierea plus Bauhinia sens. lat., but this relationship has not been well supported (here shown as a polytomy). In addition, relationships among Lysiphyllum, Phanera, Lasiobema, and Piliostigma are poorly resolved, largely due to sparse sampling from these genera. Bruneau, A., F. Forest, P. S. Herendeen, B. B. Klitgaard, and G. P. Lewis. 2001. Phylogenetic relationships in the Caesalpinioideae (Leguminosae) as inferred from chloroplast trnL intron sequences. Systematic Botany 26: 487-514. Davis, C. C., P. W. Fritsch, J. Li, and M. J. Donoghue. 2002. Phylogeny and biogeography of Cercis (Fabaceae): evidence from nuclear ribosomal ITS and chloroplast ndhF sequence data. Systematic Botany 27: 289-302. Herendeen, P. S., A. Bruneau, G.P. Lewis. 2003. Phylogenetic relationships in caesalpinioid legumes: a preliminary analysis based on morphological and molecular data. Pages 37-62 in Advances in Legume Systematics, part 10, higher level systematics (B.B. Klitgaard and A. Bruneau, eds.). Royal Botanic Gardens, Kew, UK. Kajita, T., H. Ohashi, Y. Tateishi, C. D. Bailey, and J. J. Doyle. 2001. rbcL and legume phylogeny, with particular reference to Phaseoleae, Millettieae, and allies. Systematic Botany 26: 515-536. Lewis, G. P. and F. Forest. 2005. Cercideae. Pages 57-67 in Legumes of the World (G. Lewis, B. Schrire, B. MacKinder, and M. Lock, eds.). Royal Botanical Gardens, Kew, UK. Mabberley, D. J. 1993. The plant-book, a portable dictionary of the higher plants. Cambridge University Press. UK. Wunderlin, R., K. Larsen, and S. S. Larsen. 1981. Cercideae. Pages 107-116 in Advances in legume systematics, part 1 (R. M. Polhill and P. H. Raven, eds.). Royal Botanic Gardens, Kew, UK. Wunderlin, R., K. Larsen, and S. S. Larsen. 1987. Reorganizaztion of the Cercideae (Fabaceae: Caesalpinioideae). Biol. Skr. 28: 1-40. Tylosema fassoglensis (Kotschy) Torre & Hillc.